I was saddened to learn today from LA Observed that master burrito maker Manuel Rojas, owner of the famed El Tepeyac restaurant in Boyle Heights, has died. Susan and I were introduced to the legendary eatery by our friends Arnold and Martha Ontes, who took us there back in 2005, under the stipulation that I promise to eat what they ordered for me. When our server showed up, Arnold quickly ordered a “Manuel’s Special.” But wouldn’t divulge what the catch was. Did it arrive flaming? Was it the spiciest burrito ever? There lips were sealed. In a show of solidarity, Susan decided to get the same thing and both Arnold and Martha and our server chuckled knowingly. 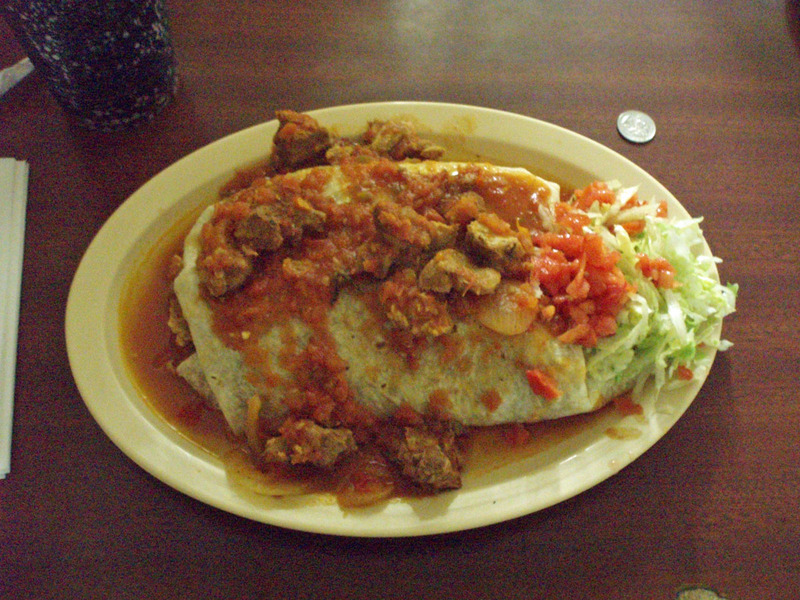 In a nutshell, the Manuel’s Special is basically two square feet of burrito. It is just about the biggest thing to occupy a plate that I’ve ever seen. When it arrived, the sight of such ginormosity alone was almost enough to take away the intense hunger pangs I was experiencing, but I dug in as best I could. Susan took a few bites of hers, and gave up. I managed to put away about 1/15th of the delicious burrito later before quitting. Ambitiously we got to-go containers and hefted the leftovers home thinking we’d have some more for dinner, but we were just kidding ourselves. As you can see from that quarter I added for scale next to the plate, the Hollenbeck is still a monster, but far less intimidating than the Manuel’s Special. I made the mistake of eating pretty much the whole dang thing — nd I say “mistake,” not because it wasn’t delicious, but because I then had to ride all the gut-busted way home from Boyle Heights to Silver Lake, and parts of that roll were pretty painful. I haven’t been back since because I think I’m still digesting parts of it. Rest in peace, Señor Rojas. Maker of the best burritos ever. This entry was posted on Wednesday, February 13th, 2013 at 2:06 pm and is filed under food, landmarks. You can follow any responses to this entry through the RSS 2.0 feed. Both comments and pings are currently closed.